In case your Facebook feed didn't have enough about this movie already. By now, you and most of your Facebook friends are sick and tired of hearing about Bird Box. We thought that after the last round of car crashes (and the stale memes), people would be sensible and not take up the Bird Box Challenge while driving—we were wrong. On Saturday, a Twitter user posted a video showing a man behind the wheel of a Tesla Model 3 performing the challenge, trusting Autopilot to take the wheel. In case the challenge's name wasn't enough to explain what happened, let's break it down. The Tesla driver, filmed by his passenger while traveling at 70 miles per hour and repeating "Bird Box challenge" over and over, tied a blindfold over his eyes to mimic a scene in the Netflix Original movie. In the film, a Jeep Grand Cherokee has its windows painted over and is driven using only using audible cues from the vehicle's proximity sensors. 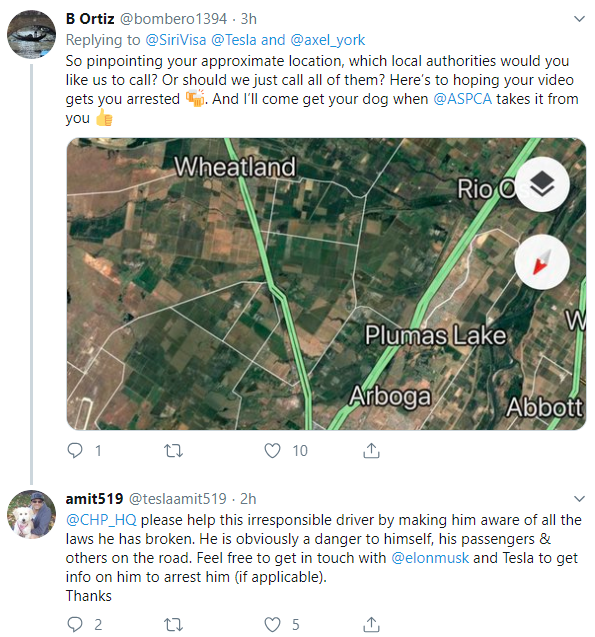 On Sunday afternoon, the tweet was abruptly deleted after being the subject to extreme criticism from other Tesla drivers. Several users preserved the video, some sending it to local authorities over safety concerns. Similar to the scene in the movie, the driver of The Tesla is utilizing a software aid in order to navigate on the road. Specifically, the driver from Twitter is using Tesla's infamous Autopilot, an Advanced Driver Assistance System (ADAS) that is able to pilot Tesla vehicles on simple divided highways using a combination of eight cameras, 12 ultrasonic (sonar) sensors, and a forward-facing radar. One important note on why this act was dangerous is that Autopilot is a semi-autonomous driving aid (at best). Per Tesla's instruction and rulings on Autopilot's limitations by the National Highway Traffic Safety Administration, the driver must remain in control of the vehicle at all times, which includes keeping their hands on the steering wheel. The Model 3's 15-inch touchscreen can be seen alerting the driver to place their hands back onto the wheel. Tesla CEO Elon Musk reportedly rejected safeguards such as eye tracking which may have prevented this misuse of Autopilot. Netflix is also sick and tired of drivers attempting to mimic the scene from Bird Box. The streaming provider pleaded with the public shortly after New Years to act safely and not injure themselves (or others) with the viral challenge. Instead, fools in cars are going above and beyond in a two-ton metal rocket. Tesla recently released its second quarterly safety report for Q4 2018, showing that Autopilot accidents are on the rise. Perhaps if the public understood that Autopilot is not a fully-autonomous suite, they would be a bit more cautious when trusting the software. But with how Autopilot is marketed, despite the warnings, new owners are willingly and unknowingly abusing the software. This marks the company's fifth announcement on vehicle-based shows this year.